An environmentally benign CuO-rectorite was prepared by calcining the co-precipitation product of Cu2+ with an acid-activated rectorite at pH 6. It could be well dispersed in water and used as a co-catalyst with TEMPO to selectively aerobically oxidize alcohols to aldehydes. The conversion of most primary benzylic alcohols was very high under optimized conditions. Interestingly, the oxidation protocol also allowed highly selective transformation of benzylic alcohols containing a phenolic hydroxyl group into the corresponding aldehydes. Additionally, very little copper was leached from the catalyst during the catalytic reaction. CuO-rectorite could be reused by centrifugation and washed with acetonitrile and water. At the same time, its catalytic activity remained high. 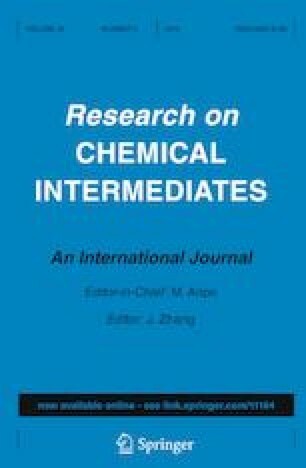 The online version of this article ( https://doi.org/10.1007/s11164-018-3618-3) contains supplementary material, which is available to authorized users. This work was supported by the National Natural Science Foundation of China (no. 31270616) and the Key Laboratory of Fermentation Engineering (Ministry of Education) Open Foundation. The method of determining copper content of CuO-REC, HPLC analysis of CuO-REC-catalyzed alcohol oxidation (Fig S1-S21) and spectroscopic measurement data (13C NMR and 1H NMR) of the isolated products (Figs. S22–S53) are given in a supplementary file (DOCX 10573 kb).